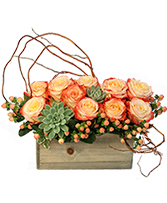 Take the traditional bouquet of roses to the next level with this arrangement! 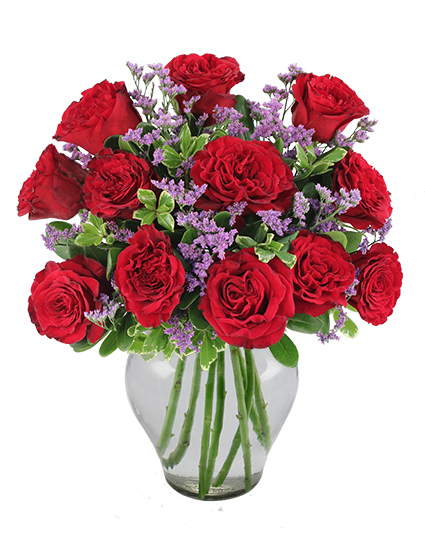 Succulent red roses are highlighted with delicate purple caspia for a new twist on an old favorite. Show her you mean forever with these flowers. Order online or call us today! **Flowers, foliage and container may differ due to seasonal availability. All efforts will be made to create as similar a product as possible to item pictured. 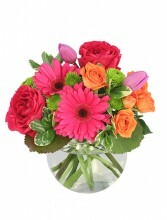 Bright for Spring, fiery blooms of hot pink gerberas, hot pink roses, mini orange spray roses, and purple tulips create a bubble of happiness. Send these fresh flowers to those you love this spring! **Flowers, foliage and container may differ due to seasonal availability. All efforts will be made to create as similar a product as possible to item pictured.